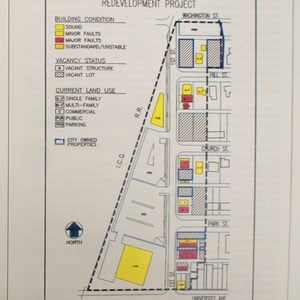 Map showing the state of the buildings along North First Street, as of 1995. Describes the fight to end discriminatory hiring practices at a newly opened J.C. Penney's in downtown Champaign through quantitative and qualitative surveying. A report on various issues African-American residents of Champaign-Urbana faced during the 1940s. Compiled by the League of Women Voters.